I had a fantastic weekend--the getaway was exactly what I needed. Part of me wants to share every detail of my time there, but another part of me knows that the experience isn't really one to be shared with the world wide web. It was restful. It was healing. It was more than I could have asked or imagined. And that's about as much as I'm willing to divulge. I'll be back in a day or two with some VERY exciting news! I sat down this morning to try and blog about some things I've been processing this week and John walked in the room and asked if I had a few minutes to talk. 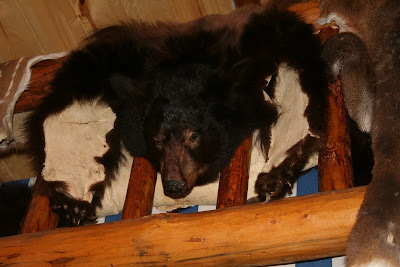 Some friends graciously offered us the use of their mountain cabin this weekend. They knew we were beyond tired and hoped we could get away and purposefully relax. Their cabin is in one of the most beautiful spots in Colorado, and it sounded like the perfect weekend--full of beauty, family, and rest. What John wanted to talk to me about was a change of plans. He has a few things weighing on him that he really has to get wrapped up this weekend. One of our kids does NOT want to go, and we still hadn't figured out what to do with Jack-the-beagle this weekend. John wondered if I would possibly consider going alone. Alone? To the mountains? To that place of spectacular beauty? To rest and recharge? All by myself? It's a big change, but I'm thrilled. I will miss my family, but I know deep down that this is just what my weary soul needs. My packing list is much shorter now. I'm bringing my hiking shoes. My bear bell. Books, books, and more books. My Bible and journal. My iPod. Sunscreen. Sunglasses. Jacket. Flannel pjs. SmartWool socks. Maybe a movie or two. My ball cap. Some comfort food. Coffee/tea. I'm not packing: makeup, my cell phone (it doesn't work up there anyway), or my computer (there's no internet, but on second thought I might need it to watch a dvd). John and the kids may come up tomorrow for a little while, but he told me he'd really love for this weekend to be a time of rest for ME. I'm so grateful for him and his willingness to gift me this way. Also grateful for our friends, S & G, and their generous offering of their cabin. I've got to get going and get packed. I've already started praying for the weekend--specifically that God would meet me there! I'll see you all next week. In the meantime, I'll be here...unless I can find a hammock. I was catching up on my Google reader this morning and came across this post on Boomama's blog. It has a link for the bargain of the century--13 issues of Southern Living for $5. FIVE dollars. Ya'll that is a steal. I adore Southern Living. I get giddy when my new issue arrives each month and can't wait to hole up by myself and read it from cover to cover. The recipes are wonderful, and the southern homes and gardens are absolutely gorgeous! Shhhh...don't tell my family but every time I read it, it makes me homesick for the South! So, if you're not a subscriber, what are you waiting for??? This southern-turned-mountain-girl would never steer you wrong! Love that Wrapupalooza title? Me too. I borrowed it from Lisa, who borrowed it from Tiffani. Tiffani is quite the clever one. Everyone had a great first day. School actually started last week, but since we were in AR, yesterday was our official first day. Everyone jumped right in without incident. The biggest shocker of the day? I didn't shed a single tear. Unbelievable! Abbey has the same teacher/class as last year (huge blessing!) and is my only child left at our beloved elementary school. Sarah started middle school and has all of Will's teachers from last year (another huge blessing). Will is such a laid-back kid that it didn't matter which teachers he ended up with as long as he was with his friends. Everyone is happy, including ME! I had lots and lots of running around to do while they were in school. Abbey has an Epipen for an allergy to pistachios so I had to get that refilled and all of her medical forms signed/faxed to the school, and get some appointments scheduled for check-ups/shots next week. Also had to buy groceries since I haven't cooked in a month. I've been gone three of the last four weeks and I am so tired of eating out. Ugh. I'm finding it really hard to get back in the menu-planning/cooking groove though. Of course I also had to make a second trip to Walmart after dinner for school supplies. I was amazed a couple of weeks ago when I took the kids shopping and we found everything on our list in one trip to one store. I should have known that was too good to be true. Will and Sarah came home yesterday with an *updated* list (never mind that the list that I shopped from was the one I printed from the school website--argh!). Why do teachers do that? I feel like I'm bleeding money again and I'm ready to stop! I usually draw the line at new backpacks. (Remember this question from last year?) No one in our family got a new one last year...but this year I caved. Poor Abbey has never had a new one. She's always used her sister and brother's hand-me-downs, and I promised her this year would be different. Sadly, I didn't get one purchased before the events of last weekend transpired so her daddy took her out last Sunday afternoon to find one. She loves it. Will scored a new one too. It was my dad's. I am really hoping that the routine of the school year will help me settle into a nice pattern for the fall. Honestly, I feel like we had NO summer. Things with my dad started getting really serious one week into our summer and they went quickly downhill from there. So much of my summer was spent on the phone or on the road or in a state of worry. I'm very sad that he's gone, sure, but I'm hoping that I can begin to move forward without his health weighing constantly on my heart and mind. I let go of two HUGE volunteer commitments this year. I feel a lot of relief about that as well. You cannot know how free I feel. It's a really good feeling! I'm trying to get a feel for my weekly schedule and not overload myself. I'm such a homebody and need lots of space built into my week! It's been feeling very fall-ish here this week which is a very nice change from the heat and humidity we experienced in AR. The kids wore jackets to school today and I just made another pot of coffee. I love fall! And since summer was such a blur, I fully intend to revel in my second favorite season--autumn!!! Whew! It's been a whirlwind week and I feel like I'm still spinning. Just wanted to check in and thank all of you for your words, prayers, and thoughts for my family last week. They made all the difference. Truly. I'm still processing some of my emotions from last week (and the entire summer, really). I feel sad, relieved, frustrated, and many more things. Maybe one day I will share some of that here. Right now though I am spent. Emotionally. Mentally. Physically. And this week is shaping up to be BUSY. My kids missed their first two days of school last week, so we're getting ready for "our" first day tomorrow. They're excited but I'm feeling like summer ended WAY too abruptly. I'm also looking at my calendar for this week and trying not to scream! My mind and body are so tired and I feel like I can barely keep up with the hundred and one things that need to be done right away. Ugh. More prayers please! Anyway, I must get going. I have school paperwork to fill out, backpacks to load, outfits to get ready, and I really want to enjoy some family time before tucking my kiddos in bed. Thank you again for your prayers. I'm deeply grateful. Hi, I'm Amy (better known here in the comments as Whimzie from Snoodlings). I'm blessed to call Meredith my friend and she asked me if I would come by and let you know about events that have transpired over this past weekend. Most of you know that Meredith's dad was diagnosed with pancreatic cancer in November of last year. Over the last few weeks he has battled serious infections and other complications that developed as a result of his disease. This past weekend, his organs began to fail and on Sunday morning, Meredith's dad died. Meredith flew to Arkansas on Sunday. John and the kids are driving from Colorado today. 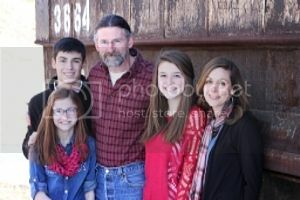 Over the next few days, Mer and her family will have a series of memorial services and visitations in two different cities in Arkansas before they travel back to Colorado. Please pray for Meredith and her family. Pray for safe travel for John and the kids today and for the rest of the family as they travel different places throughout the week. Pray for peace and strength for Mer. Pray that Mer and her family will have the wisdom they need to deal with all the details and questions and decisions that follow a family member's death. Pray that they will deal effectively with the physical and emotional stressors that this week will bring. Pray for physical and emotional health for Meredith and her family. I certainly don't know what else to say or do for Meredith right now. I can't tell you precisely how she's feeling. At times like these, I'm so grateful that she and I share a Father Who does know exactly how she feels and what she needs, because He Himself is everything she needs. In the last two emails I received from Meredith she told me that she has felt supernatural strength, grace, prayers, and God's provision for her over the last couple of days. Her faith is what will support her through this week and in the days and weeks ahead. She will also draw from our strength and encouragement and support. I am sure that she can't respond to each individual email, comment, or text right now, but I know she appreciates the heart and love behind each one. We will be patient and give her the time she needs to work through the jumble of emotions she may be feeling. I feel confident that as soon as she is able, she will be back here to let you know how she's doing. She will have tough days, I'm sure, but I am confident that she will get through this. Thank you (from Meredith) for being such sweet friends. Remember a couple of weeks ago when I mentioned that I bought a new game to take with us to the cabin? Well, Scrabble Slam! was a hit with my kids. In fact, the girls and I have played it almost every day this week. I also found LCR, the other game I was looking for, at a shop in Durango. We like it a lot, but it drags on forEVER so it's a little harder to entice my kids to play. I think the secret is to play with fewer chips! And because I'm nuts about games, I also picked up the travel version of Farkle last week too. It's way more fun than the online version (scoring is also a bit different) and Sarah is the reigning champ at our house. What I like about all three of these games is that they're small enough to keep in my purse. Last night, John called as he was leaving work and asked if we were up for dinner at our favorite mexican restaurant. Well alright, honey, twist my arm. All three games were sitting on my kitchen counter because we've been playing them all week, so on a whim I chunked 'em in my purse as we were leaving. While we were waiting for our food to arrive, I whipped out Scrabble Slam! and we played two quick games. I love that idea of taking a game to a restaurant. My friend, Chele, does this with her family and is the one who gave me this brilliant idea! I remember her telling me once that they grab a stack of cards from Apples to Apples to take and play while they're waiting. My kids had a blast once they got over their initial (pre-teen) embarrasment, and it definitely made the wait time pass more quickly. I don't know about you, but I look around restaurants sometimes and see couples and families sitting in stoned silence. Or simultaneously texting, surfing the net, or playing games on their phones. I don't want my family to be like that!!! I decided last night that these three games are staying in my purse for times like these. Note: I found Scrabble Slam! at Walmart for $5.24. I bought LCR for $7 at a specialty kids store, but rumor has it that Bed, Bath, & Beyond sells it too. Pocket Farkel was $6 and I bought it at an independent bookstore. For less than $20 (the price of most games) we now have three fun games. I think that's a bargain. Finally! Some pictures of our vacation last week. Forty-six photos with minimum commentary--the perfect vacation post! 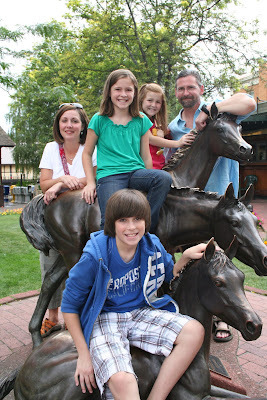 Our trip started out in Santa Fe, New Mexico. I took very few pics. A couple of these are of the kids walking the prayer labyrinth at this cathedral. Santa Fe is gorgeous. My only disappointment was that we didn't get to eat at The Shed because we were there on the one day of the week it is closed. From there we drove to Durango, CO. We rented this cabin for the week. We found it through this site (Vacation Rentals By Owner). John has used this website several times to find cabin rentals and we really can't say enough great things about it. A few pics of the interior. 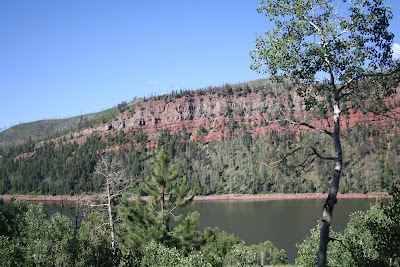 Our view from the deck--overlooking Lemon Reservoir. Gorgeous. If you click on the picture to enlarge it you can probably see some of the bare trees and damage from the Missionary Ridge Fire in 2002. (On the left side of the ridge). The kids loved playing outside. They especially loved the fire pit and feeding the healthy population of chipmunks. 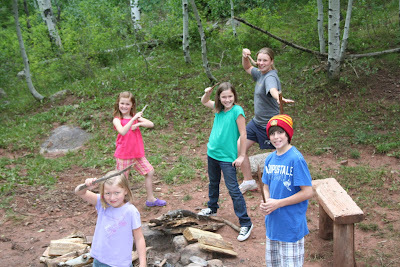 We had a rainy week, but one night John got a fire going and we made s'mores! And one morning we drove down to the reservoir and let the kids do some fishing. We didn't catch a thing and we got rained out to boot. 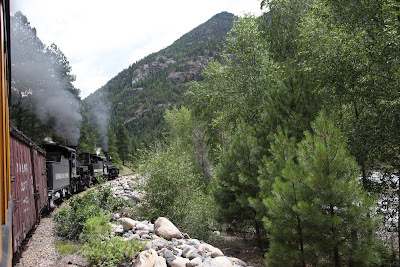 The highlight of our trip was a train ride on the Narrow Guage Railroad from Durango to Silverton. Everyone got a train ticket from John's parents on their birthday this year! Before we left for the train station on the morning of our ride, all the kids sang "Happy Birthday" to us all. Cute. 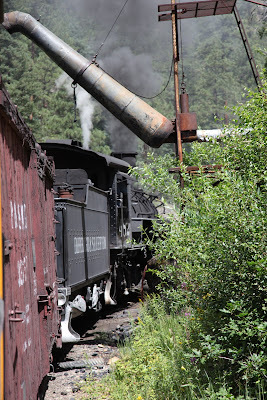 The train is pulled by a steam engine so we had several water stops along the way. 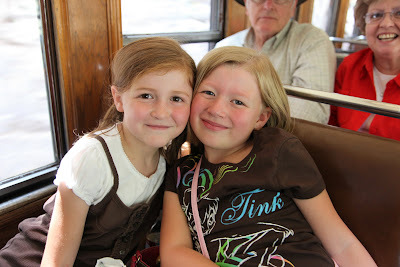 By the way, all of the really good pics of the train ride (and all the other good ones in this post) were taken by John's brother. He has an awesome camera and I'm thankful he shared them with us! Yeah, don't stick your head too far out the train windows!!! The distance between rock and train got even narrower than this pic reveals! 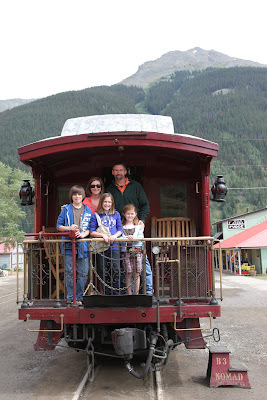 The train stopped in Silverton and we had time to eat lunch and do some quick shopping. It was a LONG day. 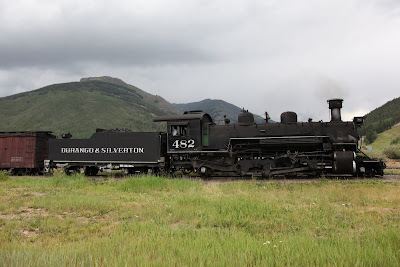 It took about 3.5 hours to get to Silverton and the same amount of time to get back. The scenery was amazing though! 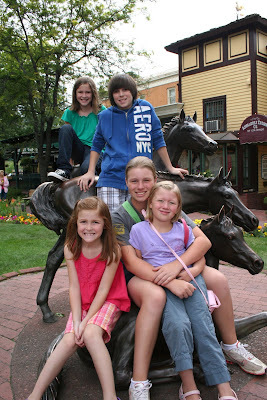 We also spent some time in downtown Durango. LOVED this car. Because I love Life is Good stuff. We decided to take the scenic route home and detour through Ouray, CO.
OH. MY. GOSH. That was the most gorgeous drive. 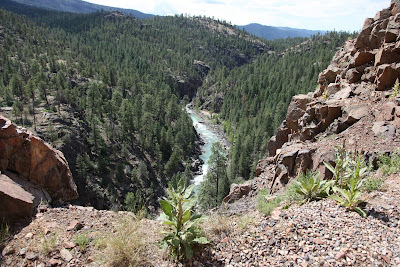 In fact, I think that southwest Colorado may have surpassed my beloved Estes Park as my favorite place in the state. It was THAT beautiful. See? The two pics above were taken at the top of Molas Pass. Now tell me...is this not the most amazing scenery? I want this to be the view from my future home in the mountains. Downtown Ouray, "The Switzerland of the Rockies". 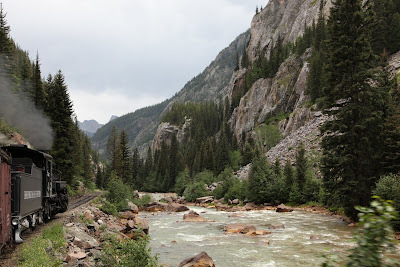 From Ouray, we traveled through Montrose, Gunnison, Salida, Buena Vista (true Coloradoans know how to properly pronounce that!) before entering our home turf. I lost count of all the mountain passes we climbed, but each one was awe inspiring. I truly love this state! Love vacationing here as well. It was a great week. And we only saw one of these. Of course it was immediately after I told my brother and sister in law that there aren't any snakes in Colorado. Go figure.